As the world’s demand for seafood continues to rise, new methods for tracking global commercial fishing activities are imperative. In a groundbreaking study published in the journal Science, some extraordinary data are showing how fishing vessels are covering the world’s oceans, and which countries are bringing in the biggest catches. Much of the data in the study was gathered by Global Fishing Watch, a partnership between Oceana, SkyTruth, and Google. 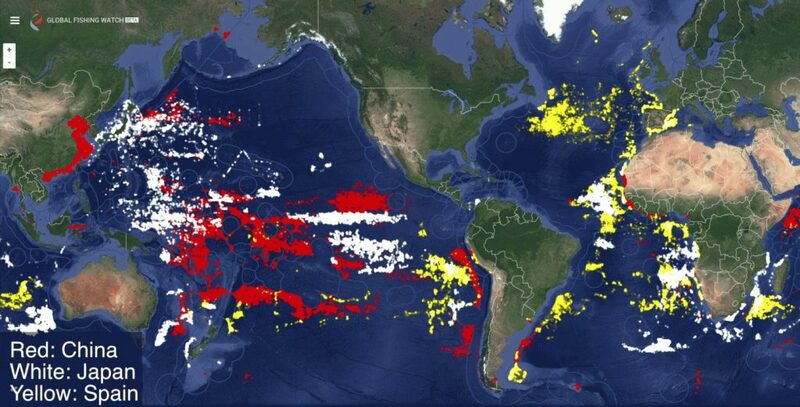 The organization uses high-tech satellite images and AIS (Automatic Identification Systems) to monitor, record, and track the movement of fishing vessels around the globe. In the past, this data was collected using logbooks, observers in fishing ports, and electronic vessel tracking. Despite its suggestive nature, this information was often out of date, incomplete, and inaccurate. The accuracy of the newer methods is connected to the massive amounts of data collected between 2012 and 2016. Over 22 billion AIS messages were logged, identifying more than 70,000 vessels. Computers running sophisticated software programs searched for patterns in the large data sets. They were able to match vessels to fleet registries and track vessel movements. Computer algorithms were also used to determine when a vessel was fishing and what it was fishing for. For instance, the data collected in 2016 reveals that of the vessels tracked, over 40 million hours were spent at sea and the vessels traveled approximately 460 million kilometers. While not all fishing vessels share their locating via this technology (particularly those who are fishing illegally), many countries (including the U.S.) require that vessels over 65 feet or towing vessels over 26 feet broadcast an AIS signal. This technology and regulations were originally in place to keep large vessels from colliding at sea. Collectively, the tracking data reveals that over 55 percent of our oceans are being fished, which is four times more of the earth’s surface than is currently being used for agriculture. It has also been determined that just five countries (China, Spain, Taiwan, Japan, and South Korea) account for over 85% of all fishing globally. The U.S. accounts for approximately 5.2% of global catches. Longline fishing was the most prevalent type of global fishing, accounting for 45 percent of all activity. Longliners also traveled the longest distances per trip of any other type of fishing vessel, with the longest recorded journey being 7,100 km. The satellite maps also reveal that some areas were not being heavily fished. This could be because vessels are turning off their AIS beacons, but some scientists believe that these areas are neglected due to their locations, and the gap might allow depleted stocks to regenerate. The interactive maps are available for viewing at Global Fishing Watch. The program hopes scientist, governments, journalists, fishermen, and citizens will use the information to better understand our oceans and foster a more sustainable fishing industry.